Home > KMS	> Inkwell’s Secret Diary – Maple All-Stars Mobilized! Inkwell’s Secret Diary – Maple All-Stars Mobilized! That dream has finally been realized! So I guess they’ll open the creation of all characters for this Winter update. Possibly permanently? Only a couple more days until we get our sneak peek of the patch! That’s like…the most generic comment you can make about a post ._. Yay, You get to make characters again. That’s totally more interesting than a new job. I cant wait to see whats the equipment revamp is about. Other MS’s don’t have them permanently. I believe that was just a sneak peak tho. YES! OPEN THEM CLASSES PERMAMENTLY NX!!!! Wish they would hurry and release Oz,Irena,Icarut and Hawkeye ಠ_ಠ Although,I’d rather have Aran’s and Evan’s storyline updated first. Aran’s make me think he was just a regular warrior who didn’t run away from the black mage. Evan is just very cliche and predictable. I -hope- they make it so every class is permanently available. Cause it made no sense (at least… to me it didn’t) to have ‘temporary’ classes. Ever heard of corporate marketing? It obligates people to play during the limited period. But people could always just make a class and save it for later when the class gets removed. Well good luck, I hope the patch isn’t too serious a change as it seemed in KMST. Max! why isnt leafre.net in your recommended links? its an amazing KMS/KMST comunity, they help a lot of people and a lot of good guides are in there! lol they help people to get to KMS…is that a bad thing? also they help people having trouble with something. Maybe all charactors get buffed? Honestly I don’t complain about limited time, but if they bother removing it, they should make a longer period of time between each interval otherwise it will seem less special when the classes come back. Why does specialness matter? Aran and Evan were permanent, they got taken away just because they were heros. They even got bad hyper skills combo recharge is.useless compared to combo infinty. Summon dragon is slow and Isn’t very effective. I love aran, but every other limited class is a very powerful one. They should make the legend classes only one character per account. Is there an update on KMS right now? I can’t seem to log in for the past 3 days (started sat night) or is it me only? Permanent Man Cannon and Mickster? im gonna be honest, i really liked the little color system they had before. i like small details but this new screen looks pretty boring appearance wise. Thing is, after you click the job selction, it gives you the same details. And personally I think it’s much more cleaner. This. But yeah, every character must have a separate cash shop inventory because Nexon thinks it wont be profitable otherwise, when in fact, people would be more encouraged to main new classes. However, i doubt they will change their minds in the near future since they are implementing karma limit, another character restriction. 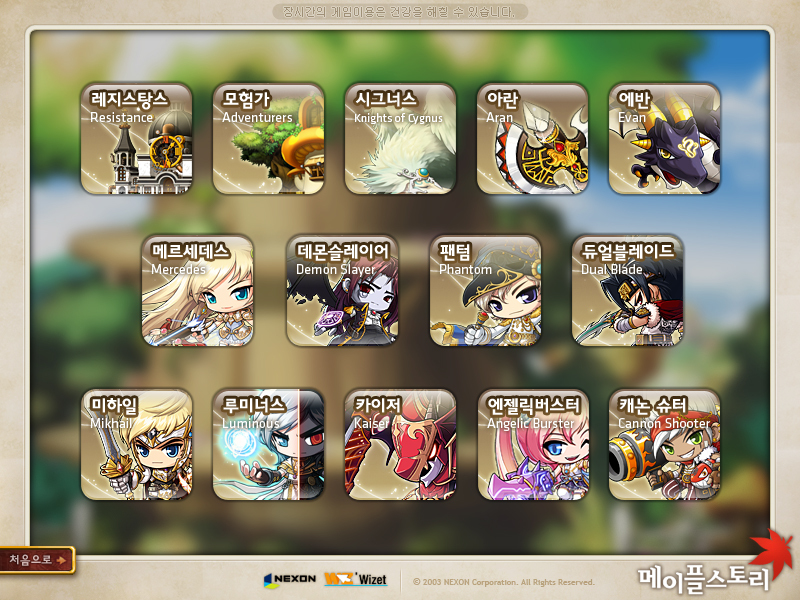 Maybe they want us to have a look on the new cover page of MapleStory and to test it out. It is stupid to block the character creation if they have a new page. Can’t wait for more information about the new update for KMST! honestly i feel maple is totally losing its fun and greatness with all this bonus potential and mass amounts of character development revamps and less content of the entire game itself such as maps, areas, questing, storyline stuff, training areas, some of the things since pre BB awesome fun. hopefully this next MAJOR BIGGERBANG update will change that. oh btw i think the HYPER SKILLS is what really made Shakar96 quit, IMHO. another btw what will you think this next MAJOR WINTER Update will be subdubtitled? Darkness is called the EMS exclusive patch with the vampire castle content.It’s a huge questline with ~75-80 quests,a skill which can summon a fire spirit and special equipment. well the new patch note is out! Does this mean I can finally make an Evan during Winter Break? kMSt ver. 1.2.457 – Demon Avenger & MapleStory Unlimited! kMSt ver. 1.2.456 – Huge System Reorganization & Winter Update Teaser!